Lawrence was assigned to B Flight, acting as a runner and clerk for the men maintaining the aircraft used to teach the cadets to fly. It was here that a new and happy phase of his life started. He became fulfilled with his role in the RAF, making firm friends among his fellow aircraftmen. This period of relative contentment is reflected in the last few chapters of The Mint, his book about the RAF. motorcycle to celebrate his return to the RAF and it was on this 1925 SS 100 named George V that he made many journeys around the countryside for the pure pleasure of riding. of him on one of his Broughs. 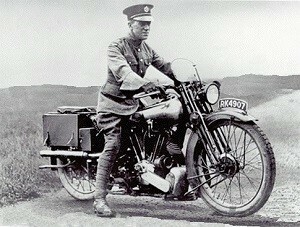 It is this motorcycle that appears as the mighty Boanerges on which Lawrence roars about in The Mint. Lincoln is most probably the stretch of road where he claims to have raced – and beaten – a Bristol Fighter on his motorcycle. cribes having a ‘cup of real chocolate and a muffin at the teashop’. Lawrence writes of sluicing his head with water outside the White Hart. If you are visiting Lincoln in his footsteps, take a look to see if the yard-pump is still there. 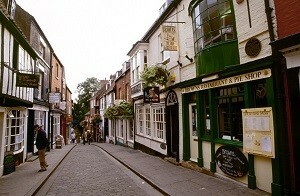 Then head to Brown’s Pie Shop in Steep Hill where a plaque informs passers-by that Lawrence lodged here on occasion. 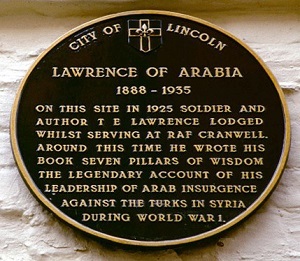 Before returning from Lincoln, Lawrence would take the opportunity to stop at shops and farms to buy bacon, sausages, eggs and dripping to take back for his fellow servicemen at Cranwell. Today, RAF College Cranwell is still where officers receive their training. The main entrance hall displays a portrait of Hugh Trenchard, ‘creator’ of the RAF and friend of Lawrence. The library contains a huge quantity of Lawrence-related material, including a proof copy of the Subscribers’ Edition of Seven Pillars of Wisdom which is kept in its own display case. 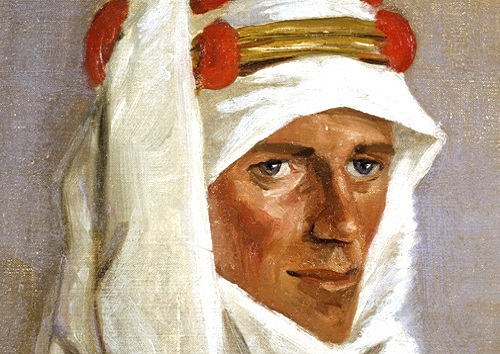 It was while at Cranwell that Lawrence finished writing Seven Pillars, and his subsequent posting to India at the end of 1926 was partly to avoid the publicity caused by the publication of his book and its abridgement, Revolt in the Desert. considerations and visits have to be made by arrangement. See Newsletter 113 for a report and photographs of the Society’s most recent visit in September 2015.